Have you ever walked out of the practice room and wondered what the heck you spent the last few hours doing? Maybe it wasn’t a terrible practice session, but it probably wasn’t that great either, right? Sometimes practicing feels like walking up the down escalator – having to redo passages you’ve already practiced, struggling with the same problems, zoning out or going on autopilot, or not knowing how to take your music to the next level. Congratulations, you’ve reached a practice plateau. Stretch. Not only does this gear our muscles for what’s to come, but this is also a mental cue to focus on your practice. Stretching is a great way to prevent and lessen injuries (just like when you exercise), and I use this time to plan what I need to work on and create goals for my session. Create a good warmup. Practicing without a proper warm up is like going about your day without eating breakfast. Very few people are successful in either endeavor. Skipping a warm up is the musical equivalent of being “hangry.” What’s a good warmup? That depends on the player. Frustrating answer, right? I know musicians who warm up for five minutes, and some who warm up for an hour or more. A good warm up also depends on your schedule. If you can only practice for an hour, it doesn’t make sense to warm up for 45 minutes. For me, I like to do a few long tones to get my air moving, scales to get my fingers moving (and hello, scales are super-important! ), and articulation to get my tongue moving – about 20 minutes total. The key to a good warm up is making sure you are focusing on improving fundamental issues. If you have breathing problems during your long tones, what makes you think they will go away in your solo rep? Experiment with different warm up exercises and find what works best for you. Change the rhythm. While you’re slowing down technical sections, you can also alter the rhythm. 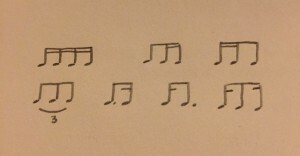 Not only is this a mental challenge, but it’s also a great way to work on rhythm. This exercise is especially useful when you have straight sixteenths (Weber’s 2nd Clarinet Concerto was made for this kind of practicing!) 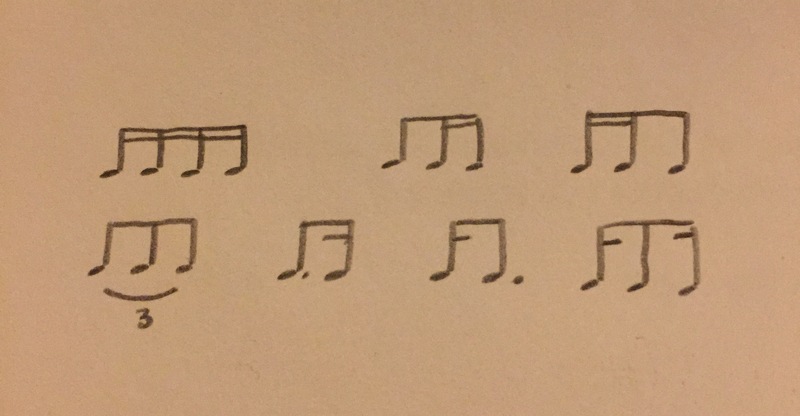 Here are some rhythms I use, but be creative and make a few of your own! Change the articulation. Experiment with switching articulations and tonguing patterns (slur two, tongue two; etc.). Just like altering the rhythm can improve technique, changing small details like tonguing forces your mind to focus on other details (and makes it pretty hard to go on autopilot). Tongue all of the notes in technical passages. Doesn’t this sound counterintuitive – why make a technical section even harder? Besides the obvious articulation practice, tonguing every note, especially at a slower tempo, gives your fingers a split second in the space between notes to get to the correct keys. This is especially useful if you notice your fingers aren’t moving smoothly in slurred technical passages. Make a musical quilt. Ever sewn a quilt? Me neither. But, I get the idea – make a single square, repeat. Combine two squares. Repeat. Pretty soon you have your quilt. Approach music the same way. Work on a small section at first (it can even be one beat if it’s very challenging), then work on the next section. After you feel confident with both, add them together. By perfecting smaller sections and looping them together, the final result will be much more coherent than if you had hacked your way through the entire piece in one go. Play each section correctly three times in a row. My middle school band director always told us that amateurs practice until they get it right, and professionals practice until they can’t get it wrong (there is some confusion as to the origin of this quote). If you ever find yourself repeatedly working on the same sections without noticeable improvement, this is probably your culprit. Most people practice a section until they play it correctly, then proceed to the next section. Make sure you know what you did to play it correctly, then test yourself by playing the same passage three times in a row correctly. Three is somewhat of a random number – two times in a row could be a coincidence, but three is the beginning of a pattern. Want to make sure you’ve got it? Try five times (I like odds better than evens). Don’t stop when you make a mistake. This is especially true during mock auditions or performance run-throughs. If you are used to stopping and fixing mistakes as they happen, how are you preparing for mistakes if they happen during the actual performance? One of my practice philosophies is that it is just as important to practice recovering from mistakes as it is to practice avoiding them in the first place. Anyone can (and will) make mistakes, but what separates a good musician from a great musician is making split-second adjustments during high pressure situations (aka concerts and recitals). This requires mental fortitude more than anything else, so embrace accept your mistakes as a chance to become more mentally flexible. Take breaks. Give your mind and body a rest. I take a 15-minute break every 45 minutes, but there are new studies suggesting a more awkward work/break ratio. Just make sure you’re taking a sizeable break every so often rather than getting sucked in to social media every five minutes, because that is one of the top practice saboteurs. Practice plateaus can be frustrating, but by tweaking a few practice techniques and mental strategies, you’ll break your plateau in no time!